DAY 10 Dnieper River Cruising. (Fri.) Scenic Cruising. 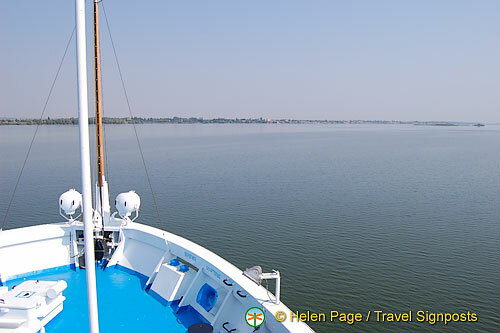 Spend a relaxing day onboard as you cruise along the Dnieper River. The countryside on both banks of the peaceful river is varied; on one side steep rocks rise, on the other you can look across fertile fields and meadows. The ship sails overnight on your way to Kiev.Captain’s Farewell Dinner. Gather this evening to toast your memories and say farewell to your new found friends at the Captain’s Farewell Dinner. Today is a whole day of cruising along the Dnieper River as we make our way to Kiev. We won’t be arriving till the next morning. There are various information sessions to fill the time. 10:00 More information briefing about the Ukraine and opportunity to ask questions. We pass through the Dneprodzerzhinsk lock this morning. 12:00 Briefing on programme for Kiev and disembarkation formalities. 14:15 Presentation about other Viking River Cruises. This afternoon we go through the Kremenchug lock and a little later we see the Kremenchug railway bridge, one of the oldest on the Dnieper River. You can watch the bridge open for the passage of the ship. 17:00 You can watch a DVD on the highlights of the cruise in your cabins – and buy the DVD. 19:30 Captain’s dinner followed by a Crew Show. The captain, chef and hotel manager do their walk around.